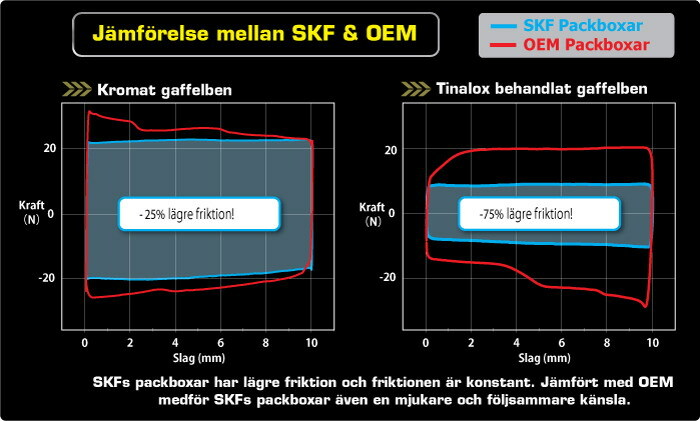 SKF (Svenska Kullager-Fabriken = Swedish Roller Bearing Factory) establised 1907 has since always been known for their very high quality and innovative products. Now they have started to make motorcycle seals and of course they are better than anything available. The fork seals and scrapers has got 20-45% less stiction than OEM seals on chromed fork legs and up to 75% less on TiN coated. The friction is also contant with no initial spike. The wear life until the seal leaks are very good, but we recomend cleaning and oil changes at the same intervals as with normal seals to avoid oil contamination. There are also HD (Heavy Duty) kits available for riders that want longer service intervalls and rides in a lot of wet/muddy conditions. Please note: Kits are sold with one oil seal and one dirt scraper, so two packages are needed for a pair of front forks.